For the geology fan there is much of interest, from the rugged coastlines captured by the 19th-century Heidelberg School of plein air painters, to the fire-red sea of Sidney Nolan’s Inland Australia (1950) (above) or the contrasting hazy grey of John Beard’s Uluru 8 (2002), and Morning Mist, Rock Island Bend (1981) by Peter Dombrovskis, where pillars of rock stand in the river like tree-topped Tors. Most memorable is Doreen Reid Nakamarra’s Untitled (2005), an optically disorientating depiction of sandhills (tali) at the ancestral birthing place of Wirrulnga. The exhibition also includes representations of the industry which shaped the nation, in particular mining. Two pictures which caught my eye were Arthur Streeton’s Fire’s On (1891) and Richard Daintree’s photograph Gold Diggers Sale, Queensland (1864-70). Fire’s On depicts the blasting of the Lapstone Tunnel in the Blue Mountains, in order to make way for the expanding railway. 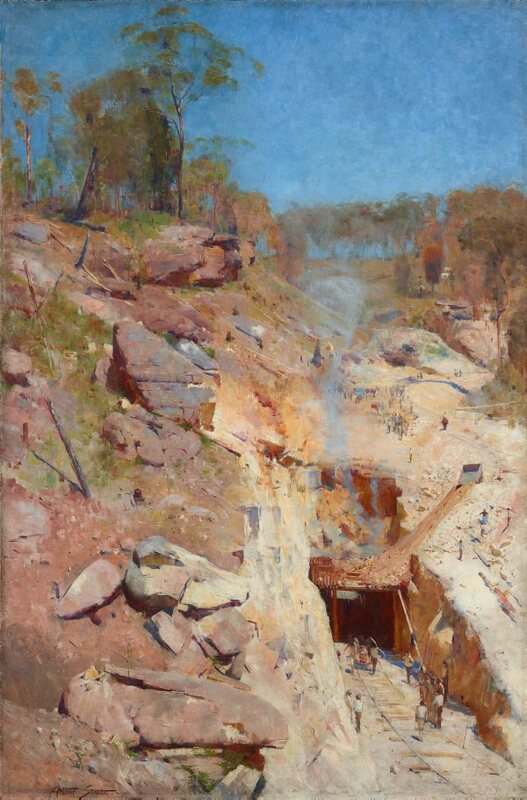 In Streeton’s otherwise picturesque rural scene of blue skies and wisened trees, flames rise from a gaping mine shaft as a dead miner is carried out on a stretcher. The picture is dominated by the huge boulders loosed by the blast, tumbling towards the mine and miners below. 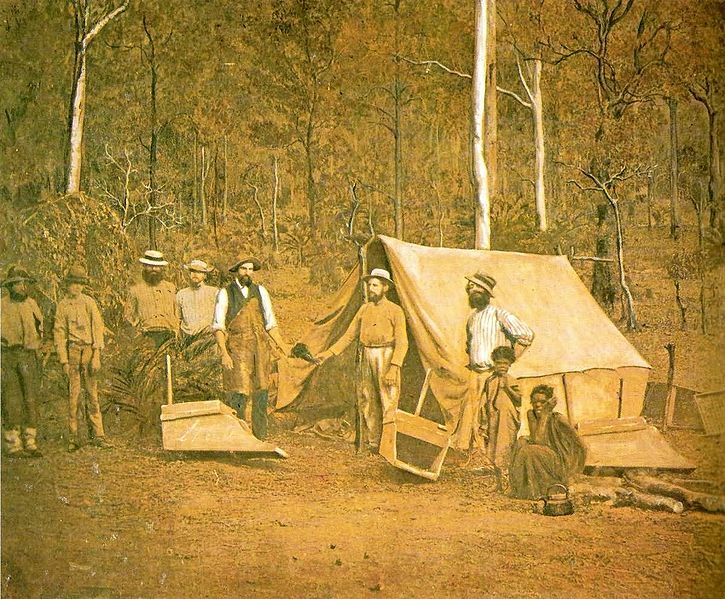 In Daintree’s albumen silver photograph (which in the exhibition is over-painted in coloured oil) heavily bearded gold miners or prospectors and an Aboriginal woman and child pose in front of a tent in outback bushland. Daintree (1832 –1878) was the first Government geologist for North Queensland; his surveys led to the first gold-rushes in inland Queensland, ten years after similar rushes in Victoria. He was also a pioneer in the use of photography during field trips – photographs such as this represent the only known images of these remote goldfields. A number of locations in Australia are named after him, including the town of Daintree and the Daintree Rainforest. Born in Huntingdonshire, Daintree migrated to Australia in his early twenties, returning to England in 1872 to represent Queensland at the London Exhibition and later taking the post of Queensland’s Agent-General in London. A Fellow of the Geological Society, he authored two articles for our Quarterly Journal and contributed to many others. 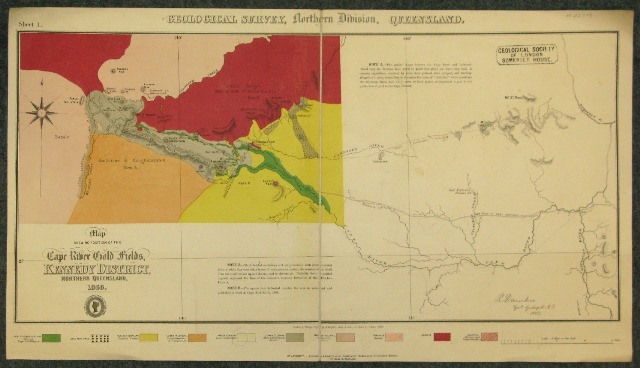 The Geological Society’s Library also holds two rare maps by Daintree in its historic collection, both called Map of the Cape River Gold Fields, Kennedy District, Northern Queensland (1868) at different scales. The Royal Academy’s Australia exhibition runs until 8th December, at Burlington House, Piccadilly, London – next door to the Geological Society. Tags: advent calendar, art, australia, exhibition, maps, Royal Academy. Bookmark the permalink.